Together with a stainless steel starter to match your Itallian charm bracelet. 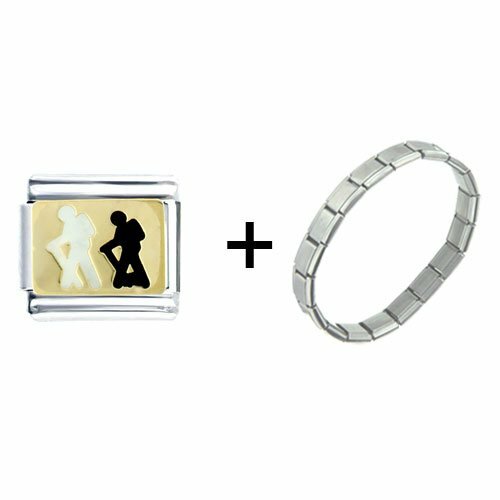 Show off your personality, hobbies, or significant affiliations with this Pugster Two People Hiking Enamel Italian Charm. This stainless steel charm features two people going hiking. Crafted of the finest stainless steel with soldered faces (as opposed to less durable glue), these charms are sure to be a hit as you build your Italian charms bracelet. You can build your bracelet all at once, or allow it to gradually evolve over the years. Either way, Italian charms bracelets are a great way to express your enduring values and style. Also a great gift for people who like to hike. Crafted and authenticated by Pugster (TM) Inc., Two People Hiking Enamel Italian charms are available for both retail and wholesale purchase in our store and are compatible with Italian charms from all major brands.